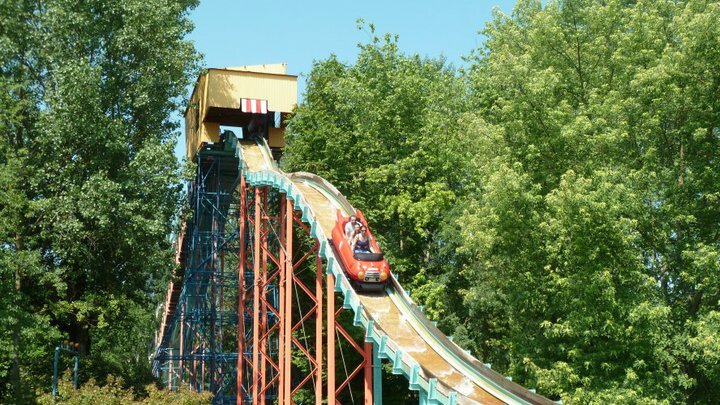 Intamin got into the log flume business in 1980 with the Wildwaterbaan at Bobbejaanland (Lichtaart, Belgium). 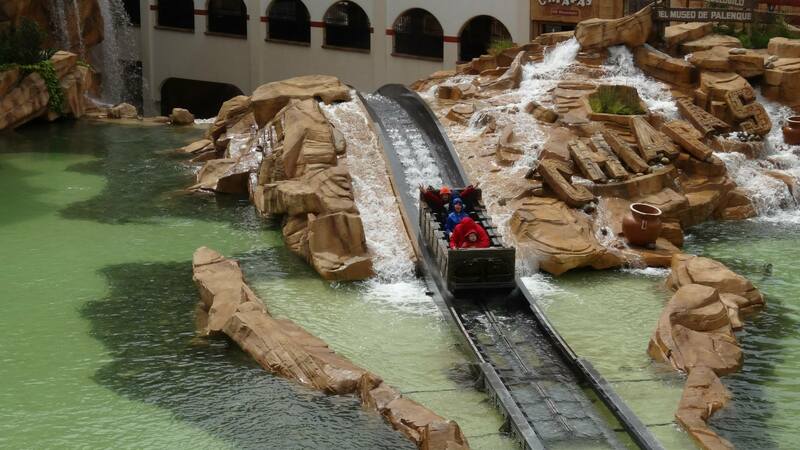 Mechanically and style wise, it is closely related to the Arrow flumes, as it features a turntable in the station and rubber conveyor belts to take the boats up the lift hills. 1982 saw the opening of Hidrovertigo at Interama/Parque de la Ciudad in Buenos Aires, Argentina. This brand new park featured a lot of rides brokered and designed by Intamin and the Hidrovertigo log flume was remarkable for its unique set-up: both drops featured parallel lift hills and drops. Sadly, the attraction closed in 2003 when the park was shut down. The park reopened in 2007 for a short period, but the log flume never reopened. In 1986, they came up with a new solution for the station, lifts and pre drop holding points. First, for the lifts, a smaller version of the river rapid lift is used. Using two parallel steel chains with hardwood boards mounted on them, this is a reliable and efficient method to take the boats up. In order to provide the smoothest experience possible, vertical drive tires are installed at the bottom of the lift and this allow the boat to enter the lift at the same speed as the chains, thus creating a seamless transition. Those tires are also used for spacing: if two boats are too close together, the second boat will be stopped and held before the lift until the previous boat has reached a certain height. It will then be driven onto the lift. The drive tires in the station. You can see the two drops among the themed structure of Mighty Mountain Flume Adventure, Leofoo Village (Guanxi Township, Taiwan). The same drive tires are used before the drops, again for spacing purposes. Sensors are mounted at the end of the drop spillway and when the boat pass those, the next boat will be allowed to drop down. The second drop spillway chute. The sensors are inside the grey boxes mounted on top of the rails. The station uses those tires again along with steel rails for the wheels of the boat. 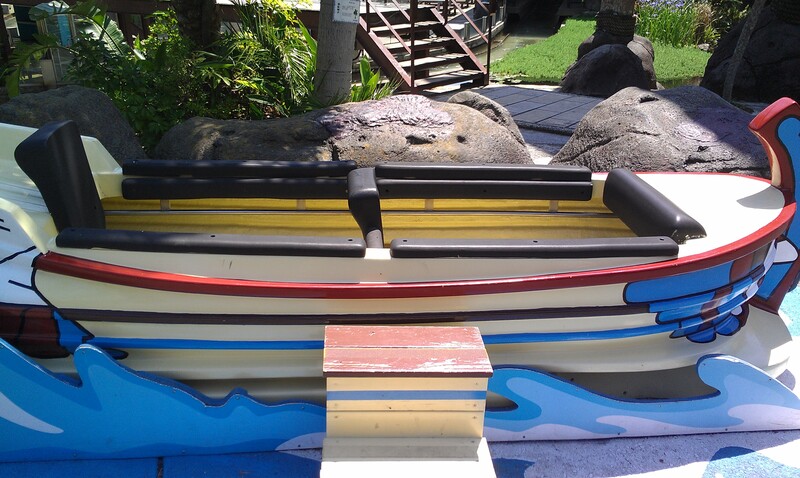 This is to provide a stable boat so that exiting and entering guests don’t have sudden movements or a rocky boat that may cause them to fall or trip. Intamin design department has offered countless styles of boats through the year. For the flume that opened in 1986 at the 1986 Expo in Vancouver, BC, traditional logs were used. Then after, in 1992 at Mirabilandia in Ravenna, Italy, a unique theme was selected: Italian sport cars. 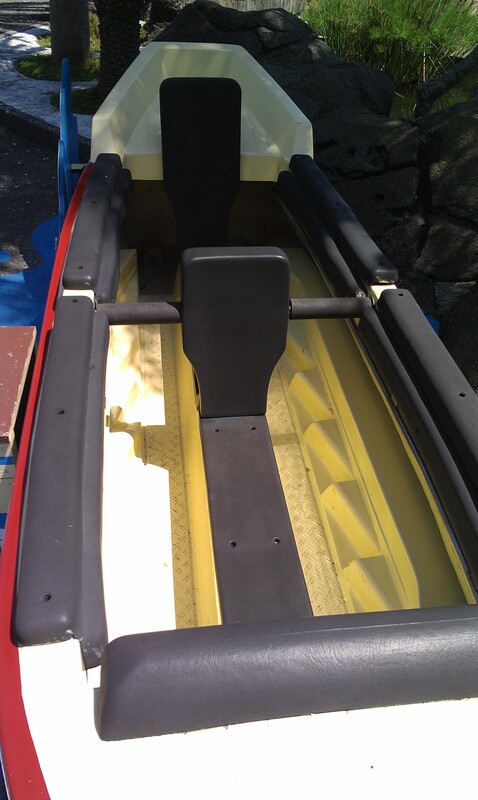 For Autosplash, Intamin designed boats that looked like Italian exotic cars and painted them in very bright colors. 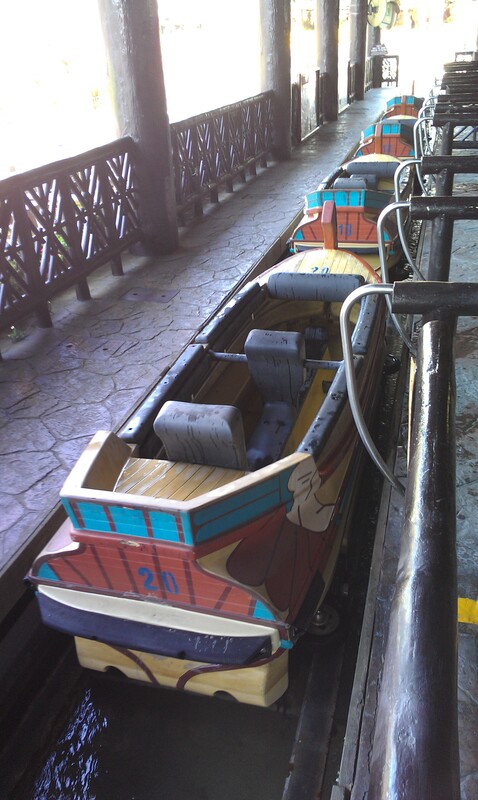 The rest of the ride features theme elements such as a car wash and car maintenance shop. 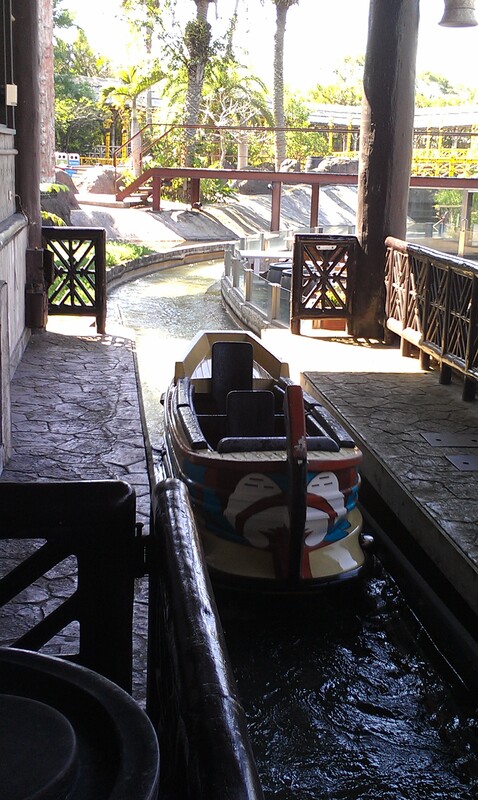 In 1994, for the Mega Mountain Flume Adventure at Leofoo Village (Guanxi Township, Taiwan), Intamin designed beautiful south pacific pirogue like boats for the themed attraction. 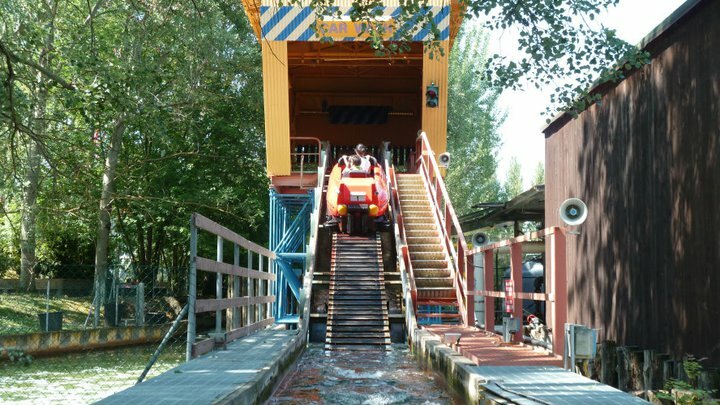 Those sport car boats are used on the Autosplash at Mirabilandia (Ravenna, Italy). Mighty Mountain Flume Adventure use those pirogues. In 1997, Intamin took the design elements they had designed for the “Maelstrom” dark ride at EPCOT Center (Lake Buena Vista, FL) and integrated them to a new flume style. 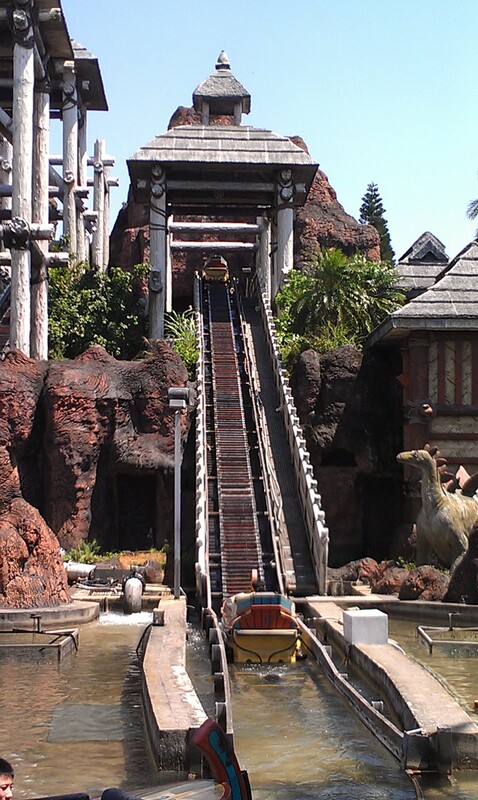 Known originally as the Reversing Boat Ride 8, this uses a large 4 rows of two passenger boat and combines it with some roller coaster elements. This was renamed recently the Flume 8. The first ride to use this system was the Typhoon Sea Coaster at Six Flags America (Largo, MD). The park was called Adventure World then and this was to be a new flagship attraction for them. It featured two drops and many theme elements to simulate a wild pirate adventure. 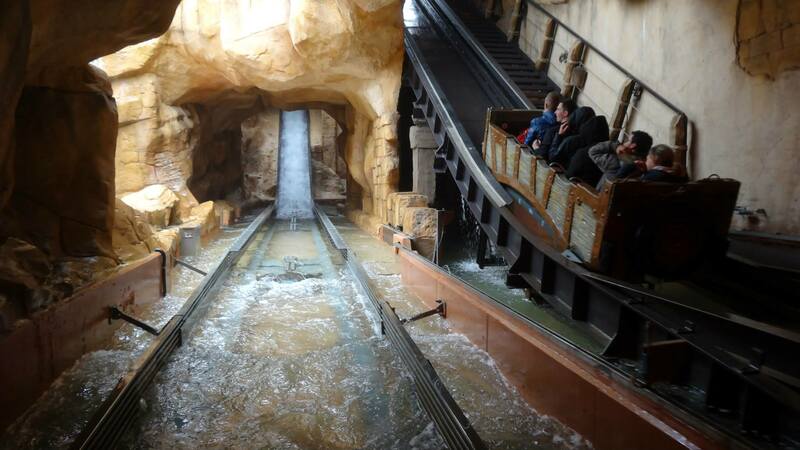 First, it had a turntable in the first dark ride tunnel and this lead the boat to the first lift hill. The boat went up the lift backward before turning and going down a steep lift. It then crested a roller coaster style hill and then dropped down again in a large splash. The boat then continued to a second tunnel where another turntable was installed and after, the boat went up the final hill. At the top, a rotating turntable was mounted and this was to minimize the space required, since all it did was spin the boat toward the final 60 feet drop. It had an incredible head chopper effect since the park had installed a large skull façade in front of it as well and the boat came out of the mouth. The ride was very well received by the public, but was always a challenge to maintain and operate for the park. Finally, in 2007, the park renovated the attraction and removed the first two turntables. This meant that the whole attraction would navigate forward and this simplified the ride a lot. The last turntable was retained simply because it was necessary to move the train from the lift to the drop. At the same time, the park renamed it “Skull Mountain”. It finally closed down on July 10th 2011 and was replaced in 2012 by a Bollinger & Mabillard Stand-Up Coaster called Apocalypse: The Ride. 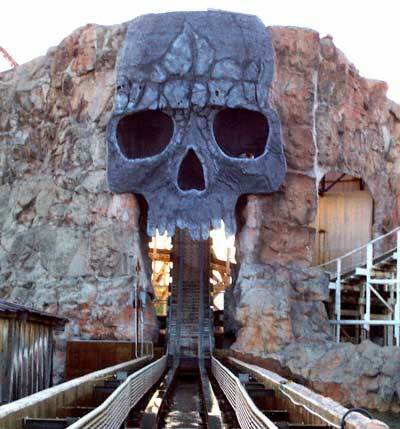 The giant skull and part of the second lift were retained as theming elements for the new ride that came from Six Flags Great America (Gurnee, IL). Typhoon Sea Coaster/Skull Mountain. This picture appears courtesy of Flex. 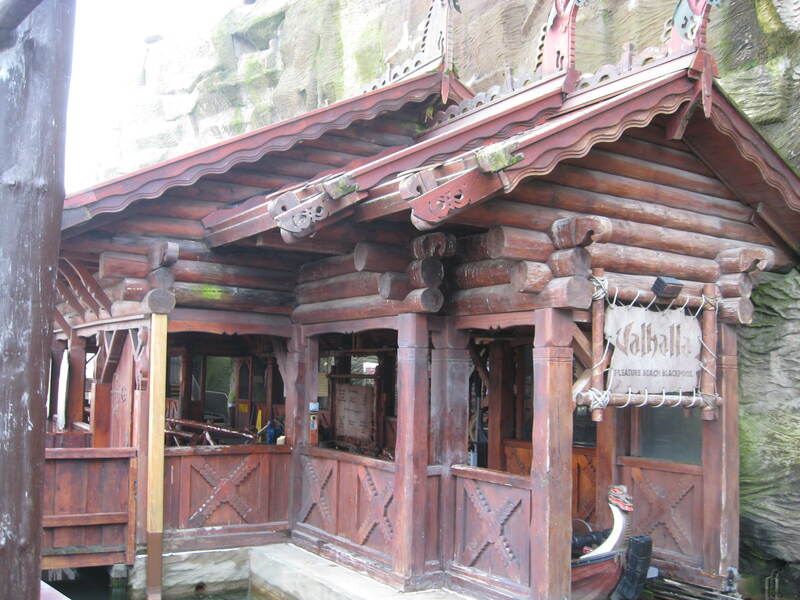 In 2000, The Pleasure Beach in Blackpool, UK premiered a brand new log flume: Valhalla. Utilizing the Reversing Boat Ride 8 system, it would be all enclosed in a large building with only the loading dock and short flume segments leading to and from outside. The ride features two large indoor lifts and is the vehicle for an elaborate dark ride experience that utilized at opening: simulated lightning, fog (not the theatrical version, but boiled water that felt hot and sticky), snow, cold, audio-animatronics and for the finale: a huge quantity of fire. The ride features 3 drops, with a small backward one similar to Maelstrom at Epcot (Lake Buena Vista, FL) and two larger ones. 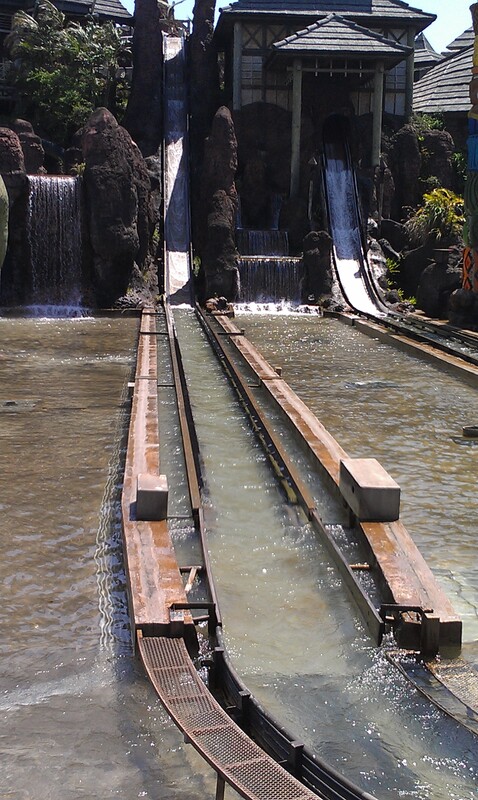 The third one is the tallest at 68 feet and features a small hill at the bottom similar to the Arrow Hydroflume. 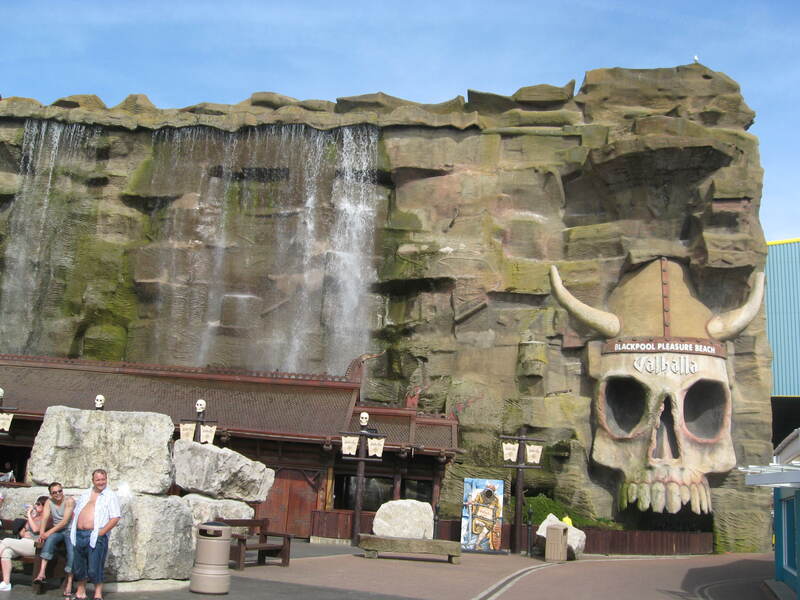 Valhalla has a beautiful rockwork facade with waterfalls. The boats leave the station and then enter the building through the skull’s mouth. Valhalla has a beautiful carved wood station. 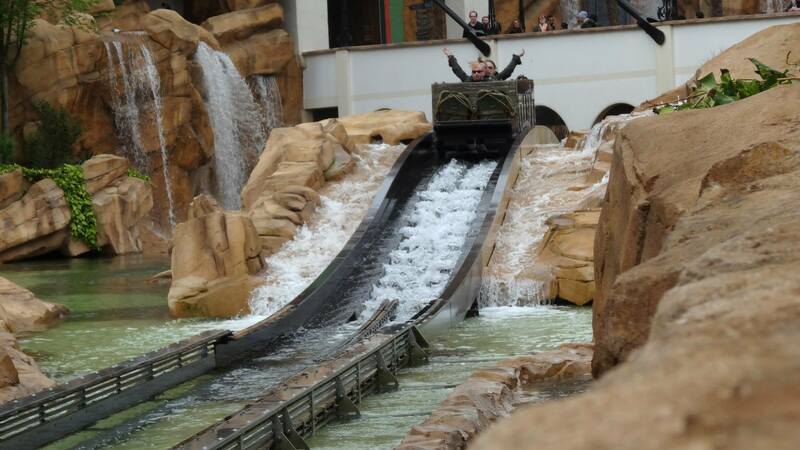 In 2014, Phantasialand (Bruhl, Germany) introduced Chiapas, the world’s steepest log flume. It features new boats that incorporates 6 individual inline seats and lap bars. Three drops are present, including the record breaking 50 degrees, 70 feet tall final drop. That drop also includes a steep airtime hill, thus requiring the lap bars for the riders. 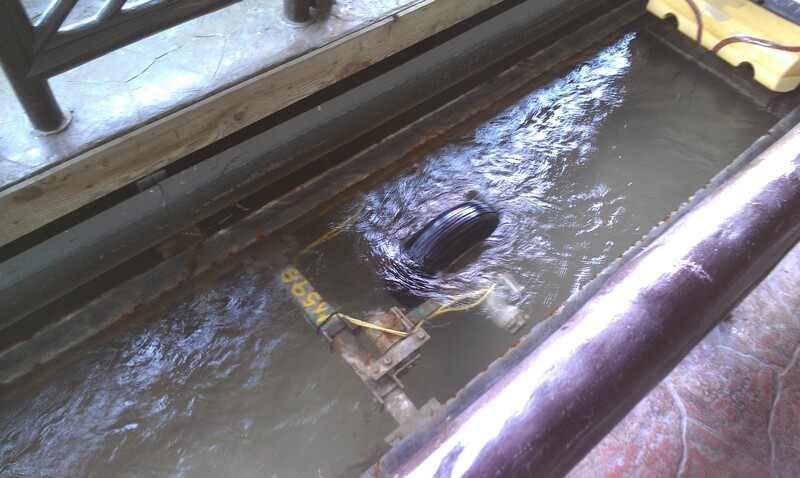 To accommodate the heavier boats, pairs of pusher tires are used in the station and before the drops. The park has a lot of rules regarding noise, so silent double chain drives are used on the lift hills. Due to the tight space requirements and size of the final drop, Intamin integrated Eddy-Current magnetic brakes on the airtime hill and spillway. 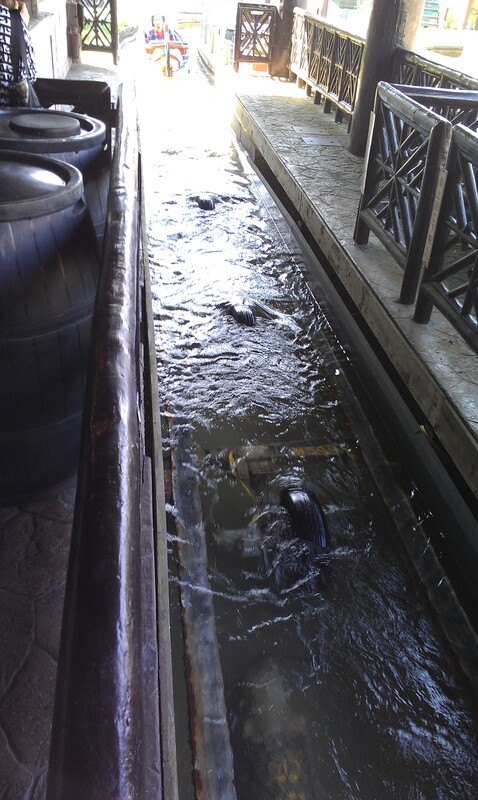 You can see them in the middle of the flume. The main issue with the Reverser 8 turntables was that they were slow and tended to break down a lot. 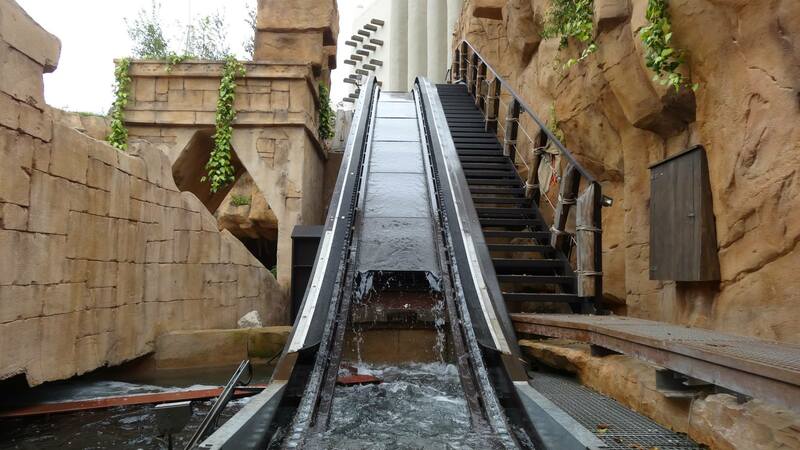 For Chiapas, Intamin resolved the issue and capacity is similar to regular log flumes with continuous loading. 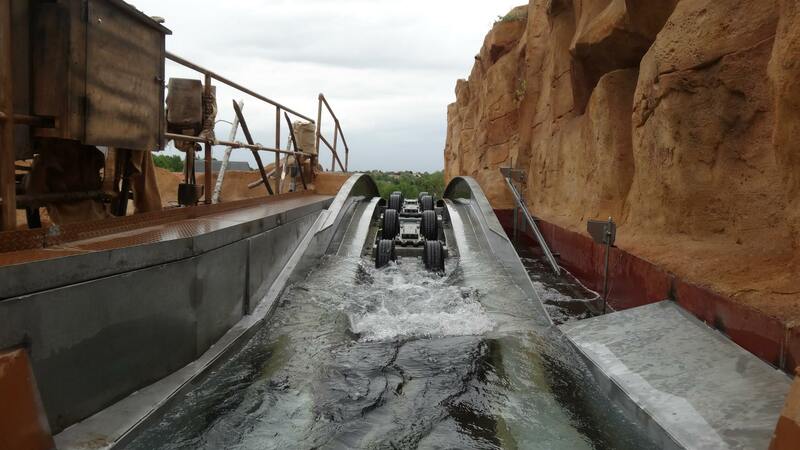 The second turntable quickly slides the boat to the side and ready to engage the lift hill. This picture shows a great overview of Chiapas. All the Chiapas pictures appears courtesy of Flex. 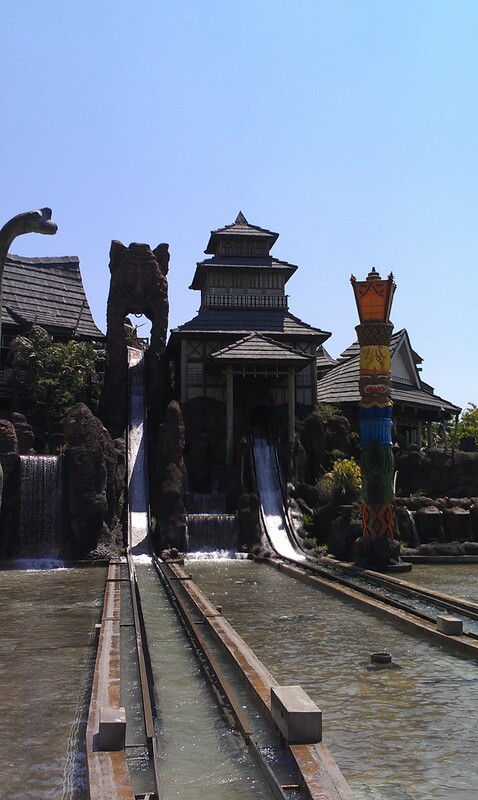 This entry was posted in Water Ride and tagged Bobbejaanland, Intamin AG, Leofoo Village, log flume, Phantasialand, Pleasure Beach, Six Flags America. Bookmark the permalink.